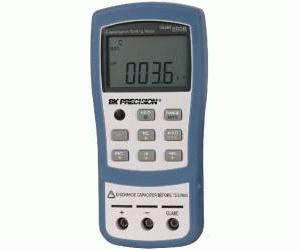 The Model 890B Capacitance Meter features a large 41/2 LCD with dual display, 11,000 counts resolution, and 9 automatically selected ranges with full scale value from 1.0pF to 50mF. Designed to meet the latest international safety standards, the meter’s dedicated chip and microprocessor allow programmable high/low limits or pre-programmed standard capacitor tolerances, making it ideal for measuring values, inspection, sorting capacitors and testing capacitors against standard tolerances. Optional software and cabling is available for PC based data logging and monitoring.